Serious chocolate chip cookie dough lovers, this one is for you! 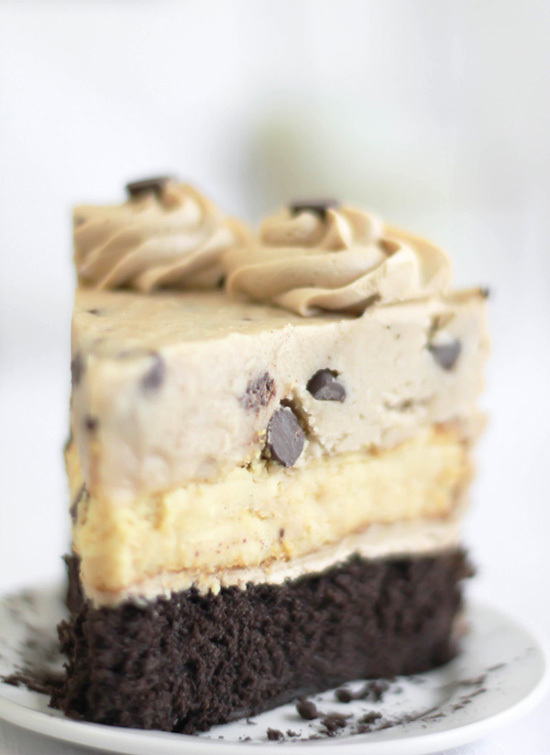 Say it with me, "Chocolate Chip Cookie Dough Devil's Food Cake Cheesecake." That's a mouthful- literally! I've taken my favorite devil's food cake, layered it with cheesecake and topped it with a generous portion of chocolate chip cookie dough. Now admittedly, this cake is a production. But each portion of the recipe is strait-forward and the end result is well worth the effort. In comparison, it is easier to make than the infamous PBC4, and most reviewers who attempted that behemoth reported back with favorable results. Like its cheesecake-cake predecessor, I suggest making this cake over the course of two days. I made the cheesecake layer and cookie dough layer on the first day, then baked the devil's food cake, made the frosting and assembled the cake on the second. This is such a fun, over-the-top cake. I suggest making it when you need something delicious to feed 20 of your closest friends! The cake portion of this recipe is adapted from Rose Levy Beranbaum's Devil's Food Cake. I have reduced the batter quantity to make one 9-inch layer instead of two 9-inch layers. Preheat oven to 350 degrees. Grease a 9-inch cake pan with vegetable shortening and line with a circle of parchment paper. Grease paper and set pan aside. In a medium bowl, whisk the chocolate, cocoa and hot coffee (or water) until smooth. Set aside. In another bowl, whisk the eggs, yolks, sour cream, half the chocolate mixture and vanilla until just combined. In the bowl of a stand mixer fitted with the paddle attachment, mix the flour, brown sugar, baking soda and salt on low for 30 seconds. Add the softened butter and the remaining chocolate mixture. Mix on low speed until the dry ingredients are moistened. Raise the speed to medium and beat for 30 seconds. Scrape down the sides of the bowl. With the mixer off between additions, add the egg mixture in two parts, starting on medium-low speed and gradually increasing to medium. Beat on medium speed for 45 seconds after each addition to incorporate the ingredients and strengthen the structure. The batter will be slightly fluffy. Scrape down the sides of the bowl. Using a silicone spatula, scrape the batter into the prepared pan and smooth the surface evenly with a small offset spatula. Bake for 30-40 minutes (check at 30). Cake is does when a toothpick tester comes out clean and the cake springs back when pressed in the middle. Let the baked cake cool in the pan on a wire rack for 10 minutes, then turn cake out onto a wire rack. Let cool completely. This crustless cheesecake uses half of a 3 oz. packet of cook-and-serve vanilla pudding mix. Be sure to add it to your shopping list! Preheat oven to 325 degrees. Grease one 9-inch springform pan with shortening, line the pan with parchment and then grease the parchment. Lightly flour the pan and tap out excess over the sink. Set aside. Cream butter and sugar in a stand mixer fitted with paddle attachment. Add cream cheese a little at a time until smooth. Scrape bowl down and beat again on medium speed, adding eggs one at a time. Add vanilla pudding mix, molasses, vanilla and baking powder; mix again until well combined. Pour batter into prepared pan. Smooth batter with offset spatula and bake for 55 minutes to 1 hour. Cheesecake will puff up during baking, then deflate when taken out. Allow cheesecake to cool in pan. Place in freezer until needed for assembly. This recipe is adapted from "The Cupcake Project" blog. It is eggless, so it can safely be eaten in its raw form, but I do recommend refrigeration to maintain freshness. A word about quantities: I love a lot of cookie dough. My husband would have liked a smaller portion of cookie dough in relation to the other layers of the cake. The table below will allow you to make the amount that is right for you. I love a little cookie dough. I love a LOT of cookie dough (shown). Line a 9-inch spring-form pan with parchment paper. In the bowl of a stand mixer fitted with the paddle attachment, stir together flour, salt, brown sugar and granulated sugar. Pour in butter and vanilla extract. Mix until a dry dough forms. Add chocolate chips and mix on lowest speed (this is "Stir" on KitchenAid machines). When chocolate chips are evenly dispersed, add whole milk 1 tablespoon at a time with the machine on low speed. Remove dough from mixer bowl and press into the prepared springform pan. Place in freezer until ready for cake assembly. Chocolate and molasses are used sparingly in this recipe to create a light tasting frosting that doesn't distract from the other elements of the cake. Combine butter and powdered sugar in the bowl of a stand mixer. Beat on low until just combined, then beat on high until mixture is thoroughly incorporated. Stop mixer and add vanilla, molasses, cocoa powder and salt. Beat on high speed until light and fluffy. Scrape down bowl and beat again until no streaks of molasses remain. Choose a serving plate on which to build and display the cake. Line the edges of the plate with strips of wax paper to keep the plate edge clean while frosting. Level the devil's food cake layer with a serrated knife. Place it in the center of the wax paper lined plate. Spread a small amount of frosting over the top of the cake - just enough to hold the next layer in place [pic 1]. Remove the cheesecake from the freezer and level with a serrated knife, if needed. (The cheesecake puffs up while baking, then sinks a bit as it cools. I usually have a small line of cheesecake around the outer edge that is taller than the rest of the cheesecake, which I remove.) Carefully place the cheesecake on top of the frosted devil's food cake, supporting it with a spatula on one side and your hand on the other [pic 2]. Remove cookie dough layer from freezer and remove it from springform pan. Turn layer over and remove parchment round. Place cookie dough layer on top of the cheesecake. 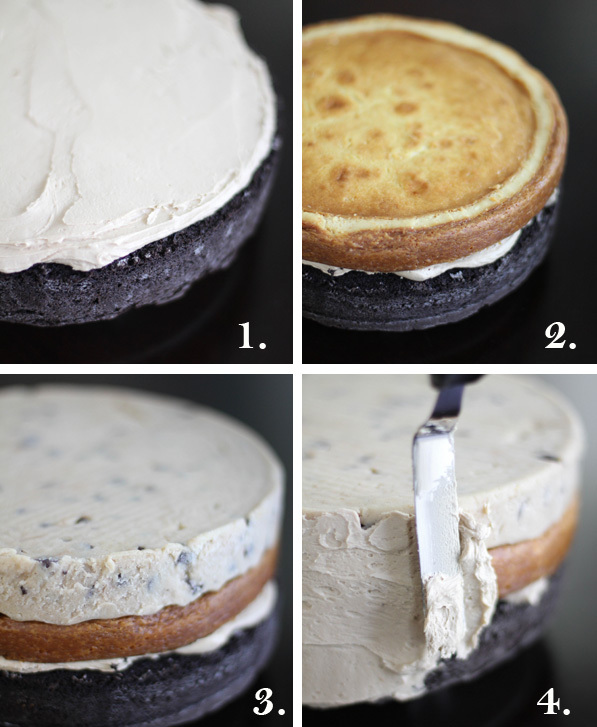 No icing is used between the cheesecake and cookie dough layer [pic 3]. Frost the sides of the cake with an off-set spatula; do not frost the top [pic4]. 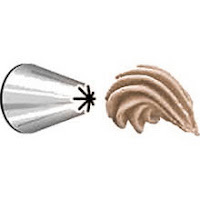 Transfer remaining frosting to piping bag fitted with a large star tip (Wilton #133). Pipe 2" swirls around the edge of the top of the cake. Press a chocolate chip turned upside down into the middle of each swirl. Optional * Gently press handfuls of ground cookies into the icing on the bottom half of the cake. This is a messy business no matter how you do it, but having someone hold the cake over your kitchen sink while you manage the task of pressing/ tossing crumbs on the cake will help. Refrigerate cake until ready to serve. Wrap uneaten portion of cheesecake in plastic wrap and store in the refrigerator. Wow! This cake is absolutely stunning and it looks really, really good! You always make me so happy with your wildly unique posts! This sounds so yummy! Wow. Where has this been all my life! Wow! this cake looks very delicious! Oh boy, I sure do love a LOT of cookie dough. Maybe this would be the way to get over my cheesecake aversion - sandwich it between sweet poofs of deliciousness. I think it could do the trick! That is a beautiful thing. A beautiful beautiful thing! WOW - this is one delicious looking cake! I love the photos as well. So glad I found your blog! My husband would go CRAZY for this! And I'm drooling over the chocolate molasses buttercream. Well, the entire cake is stunning, but that buttercream, I'll be dreaming of that for days! Oh, now THIS. THIS is over the top, and I LOVE it. Super tutorial, also! Makes me think even I should try this! Holy cow, that's amazing. Obviously I love a LOT of cookie dough. This is the best thing I've ever seen. EVER! Oh my good gravy...I'd give my right arm for this!!! I looked. You slay me. just yesterday I made a chocolate cake + cheesecake layer but I can assure you it looks nothing, nothing, like your beauty. I almost don't even want to post it now after seeing how gorgeous yours is! This looks insanely divine!! I need to find some sort of occasion to make this because I will definitely need to share it! O.M.G. !!! Wow. I could eat this for the rest of my life. I can't stop staring at the cookie dough layer. Genius! Whoa. This is an EXTREME cake! It looks DELICIOUS! What a completely AWESOME cake! Yum!! This is insane...but in a totally good way! you. are a TERRIBLE PERSON! why would you make something this AMAZING! i am... just. so. mad at you right now CAN WE BE BEST FRIENDS?! What in the world?? This looks AMAZING! I HAVE to make it. One question. Is it overly sweet? 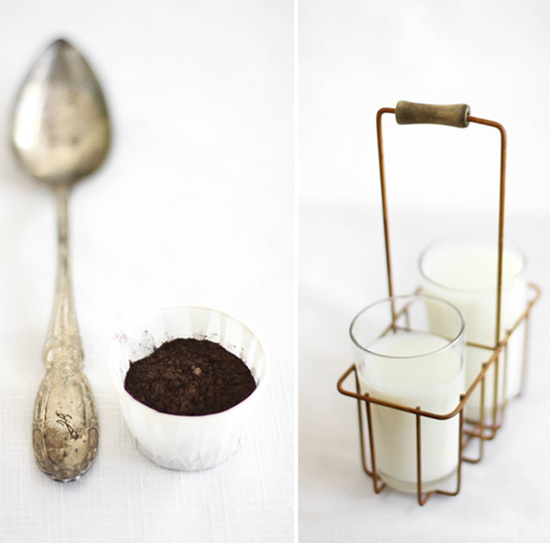 Where did you get your cake stand and milk carrier? They are almost as gorgeous as the cake. I cannot even begin to say how ingenious and tempting this is. Got any leftovers you can mail to Buffalo for me?? Thank you for such a detailed post - even down to a picture of the tip used! I should walk on the treadmill at a 70% incline while eating this. And as always, your pictures are stunning! Ok, I lied, I have another question. Did you come up with this all on your own? I am still blown away by it. Devil's food cake. Cheesecake. COOKIE DOUGH!!! I dont even know where to start with how awesome this is! vjacyno - I don't know that there is a way around it. Maybe use toasted almond flour in place of the AP flour? It would be a different consistency, bu still quite doughy. Gorgeous looking cake!!!!! I don't think I can assemble and decorate like you do (any of your creation!!) but this is ultimate temptation for me to wait for 2 days!!!!! Mine would be gone each day... However, I would LOVE to wait and eat all one bite!!!!! That is one evil cake!! Please gimme a slice!! Heather, there are no words! Yum! What a delicious looking cake! I could so eat that all in one go. Wow. This kind of reminds me of slutty brownies but an even better version in cake form! I am a bit intimidated by all the steps but when I'm ready for the challenge, I'll be sure to make this. Well done! You can never have enough cookie dough products! im normally not a fan of cheesecake, but wow...now this is a cheesecake i HAVE to try! What a labor of love! I love how it looks sliced where we can see each layer...what a treat! So gorgeous! I think I found my Easter dessert. Don't know if it will be as beautifully decorated as yours, but still can't wait to make it. I have Grandma's unsulphured molasses. Will that work for sorghum molasses? You had me at cheesecake and then you bring in the cocholate chip cookie dough! Seriously, my mouth is watering. this cake truly looks amazing. Where does the baking soda come in during the cheesecake? I would love to make this for Sunday!! Hi Mary Ellen! I knew with a recipe this long, I couldn't have gotten it perfect the first time! The baking powder goes in with the pudding mix, molasses, and vanilla addition. I've corrected it in the post and on the printable recipe. Thanks! That is what I figured, but baking soda in a cheesecake recipe was a little unusual for me, so I wanted to make sure. I'm afraid such subterfuge never entered my mind. Or integrity for that matter. To me, it's just cake. Ok, let me first say I LOVEEEEEE everything you make, bake, and create. You are truly talented. I look at your blog all the time and I pin everything you post. I can't believe I have never left a comment! 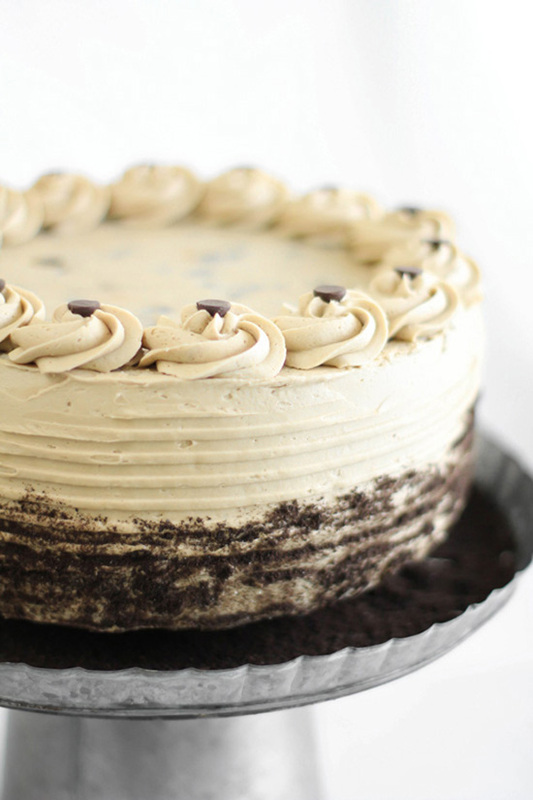 This cake looks amazing and cookie dough is my weakness so needless to say I will be making this asap. Thank you! Eating a piece of this masterpiece would be a major event..I would take my time (hours, if need be)and enjoy every morsel in every bite. This is a total WOW cake, Heather! But then nothing less is expected from you, you are simply the best! Btw, I wanted to bring it to your notice that I found one of your pics (cake slice) here: https://www.facebook.com/IndiaFoodExplorer These ppl are "using" photographs without permission, or giving credit to the creator! You are too sweet! Thanks so much for looking out for me! Complaint filed with FB, they usually respond within a day or two. Hopefully it will be taken down soon. What a fantastic cake! Your style and presentation too is stunning! So happy to have discovered your bog. I love it. This is it! I love the look and I'm sure it will taste out of this world! Nothing short of brilliant!! You are amazing my dear! Wow. This cake looks amazing. I love cookie dough and cannot wait to make this cake. Made 2 of these(one fire the family and one for hubby's office). Time consuming but worth it! The sorghum was hard to come by in Oregon but found a vanilla sorghum at William Sanoma that seemed to do the trick. Thank you fire this amazing cake! Wow, you made 2? Becky M, you are a fearless baker! Thanks for trying the recipe! This is the cake of my dreams! if I weren't already married to my husband...I'd make this cake for him and he'd marry me for sure! it's like a tower of all of his favorite things. You have the best ideas! Im in the process of making this cake! It's all smelling amazing so far! ....I just found "molasses" without specifications. Will my product taste very different? I hope it comes out ok!! I'd say the molasses you found will be fine since there's such a small amount used in the recipe. It may taste a little bolder than sorghum molasses, but overall, the flavors will still be harmonious. It turned out great! Thank you for the reply and wonderful recipe! I made this cake over the weekend, so much fun!!! Can't wait to have people taste test!!! 1. Instead of using separate cookie crumbs for the outside, reserve the top of the devil's food cake that you leveled off. Allow the crumbles to sit out in a bowl and dry out just a little. Crumble with hands and put on the side of the cake like normal. 2. Didn't have molasses and left it out. 3. Cut the frosting recipe in half and frosted it just fine. This cake looks amazing!! Lots of work, but worth it I'm sure. It's seems like cookie dough is popping up in all sorts of desserts lately. Yum! This is AMAZING!!! Is this recipe in your book? I LOVE your recipes! However, this one was way. too. much. Very sweet. And it had 7 sticks of butter. I LOVE cookie dough. My birthday is coming up in a few weeks and this is a very strong contender! Same thought as dianna: "OMG!" I just made the cheese cake layer and it turned out MUCH darker than yours inside. I used regular molasses as I couldn't find sorghum. Is sorghum a lighter color. This doesn't really resemble the color or texture of cheese cake. Wonder what I am doing wrong. Is it 2 tbsp of molasses? Has a very strong molasses taste. Sorghum molasses is much lighter than regular molasses. If you can't find sorghum, you can omit the molasses in the recipe altogether and the cheesecake should turn out fine. The sorghum just gives the cheesecake a brown sugary nuance, so it's not a major player for flavor. I hope this helps, Kathy! Thanks for the question. Ok I have tried again using only one tbsp of molasses and it looks much better. I have all the parts made except the icing and plan to assemble and ice tomorrow. The cookie dough layer seems pretty dense. Did you have any issues cutting the cake? I just don't want to crush the cheesecake layer trying to cut through the cookie dough. This is my first layered cake and I'm making it for my boyfriend's birthday. Just hope I can make the icing and decorating look nice. Thanks so much for the recipe! This could be my Birthday Cake this year. Delicious ! I baked the cake on the Weekend (as recommended over two days) and served it to my colleagues at work today. We all agree that this is the Queen of all cakes and I really really adore the recipe! Thanks for creating it and for giving it to the world! I LOVE THE CAKE and I will make it for sure over and over again! I love this cake! I'm in the UK and we don't have cook and serve vanilla pudding mix, I saw a Jell-O one on Amazon US that will ship but only in packs of 24 and seeing as I only need half of one pack it seems wasteful. Do you know if there is a suitable substitute?? This cake is absolutely to die for!! I did switch the cookie dough and the devil's food cake though, like Megan Mitchell suggested and it turned out absolutely fabulous!! Thanks for the awesome recipe!! OMG this is just RIDICULOUS!!!!!!!! I think I'll make it this weekend so I can be just as ridiculous! I just finished making this cake for my baby shower tomorrow. I've never attempted anything so involved, but it looks amazing and I love what I've tasted of the seperate bits. Because I'm in Australia, I used golden syrup instead of molasses, and I could only find Cottees instant pudding which seems to have worked fine :D I found that the cake layer shrank a little bit when it cooled, so I had to cut the other layers to size. And I crumbled a bit of the cake cut-off to press on the outside instead of cookies or sprinkles - looks a treat! In the buttercream ingredients: "1 1/2 cups (24 tablespoons or 3 US sticks) unsalted butter, salted." Huh? Unsalted butter, but salted? I'm confused, could you explain? I made this cake as I had a couple of days of work - I am so impressed by how well the recipe has worked! All layers look like yours. It's delicious! Next time I make it, u will just had less sugar as it is a little too sweet for me. Top moth cake and surprisingly doable for a totally beginner like myself! Thanks!! Just wanted to many thanks for the inspiration. Made a different more casual version this past weekend. Instead of devils food cake base made a fudgey brownie base and used the rectangle shape. Sadly I didn't think to take a photograph before it was devoured by the gang. Huge success. Can't wait to try another delight. Thanks again Sprinkles. This cake looks amazingly delicious! It is so beautiful! Thank you so much! Made this cake for my brother's birthday and everyone loved it. It took me about three hours to do the whole thing since I only have 1 9"-pan. It was my first time baking a cake out of the box, so I can say for sure to any non-regular-bakers that this cake is easy to bake thanks to the wonderful instructions and pictures provided. I don't know what sorghum molasses was, so I just used regular molasses and it came out fine. Thank you so much for this wonderful recipe that brought out some great times! this is probably a stupid question(s), but when you say to line the springform pan with parchment, do you just mean the bottom of the pan? and I assume you take the cheesecake out of that pan post-cooling pre-freezer? Uh-Mazing!! The second I laid eyes on this bad boy it was love at first sight! I finally had a reason to "feed 20 of my closest friends" ;0) and it turned out better than I imagined... only one change: I made a brown sugar buttercream instead of the cocoa molasses in the recipe and it complemented the cake wonderfully!! Thank you for this "Hit of the Party" cake!! Aaah made this with a friend for a fun girly night yesterday - oh my goodness it's fantastic. We switched up the layers so it went cake/dough/cheesecake because we really didn't think that the cheesecake layer would survive under the weight of all that dough haha. Other substitutions included using a butterscotch pudding mix instead of vanilla (yuuuum) and golden syrup instead of sorghum molasses (we're from New Zealand and molasses isn't quite as easy to come by). Thanks for the amazing recipe! Our minds are totally blown. This cake looks beautiful, just beautiful and stunning! 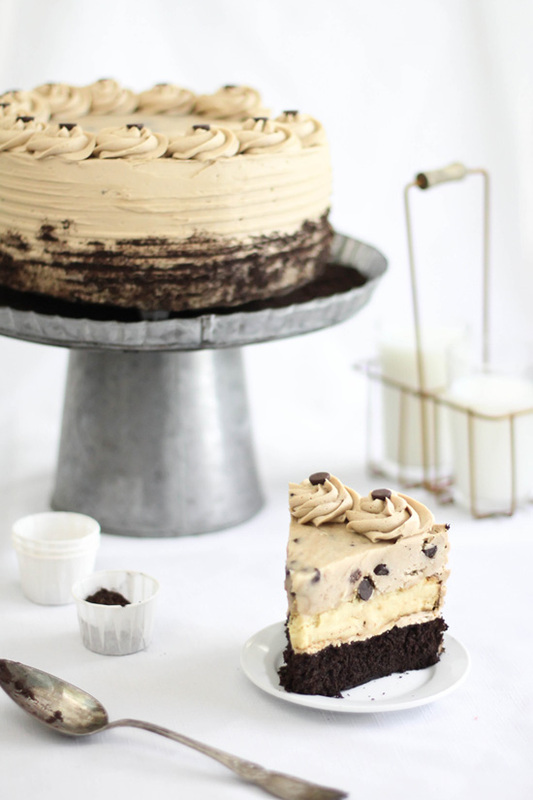 Chocolate Chip Cookie Dough Devil's Food Cake Cheesecake - this name already makes mw go crazy! Chocolate Chips flavor is my favorite. So no doubt i am gonna try this. This cake looks beautiful. Photos are really tempting. OMG can't wait to make it. What can I say but Yummy. I made this for a co workers birthday and I have never had a response to a cake before like I received tonight. Your detailed recipe made baking this so easy. Thank you. I am absolutely delighted to have found this recipe. I made the cheesecake and cookie dough layers last night and they are in the freezer now. I have a question: What temperature should they be at when i assemble the cake? straight ou of tge freezer or at room temp? thanks a ton in advance! Strait out of the freezer will be best. It will be easier to handle the cheesecake and it will be less prone to fall apart when you transfer it onto the cake portion. My daughter love cookie dough but she doesn't like cheesecake. I wanted to make this for her birthday. Would you change anything with the recipe, besides making a second layer of cake? you have great blog and i already made 2 cakes from your great collection. i have 1 question about the recipe above: can you suggest me a substitute for the orghum molasses ? (maybe light corn syrup)? Hi, Heather! It's Nicole, from Greece. We had a brief email communication last year. If you recall, I made the PBC4, and though not as gorgeous as yours, I loved it and so did most people. Greeks have completely different tastes so sadly these extravagant wonders doesn't fly as well here. I will tell you one thing, cupcakes and froyo is currently da bomb (these are suddenly revolutionary). But then a Greek will tell you they like cake, just not cupcakes... Aaaanyways... As discussed, I gave you credit http://ouncesandgrams.tumblr.com/post/20163001508/peanut-butter-cup-caramel-cheesecake-chocolate-cake My pictures aren't as good either since my trusty photographer was not present for the cake cutting. Silly question; how DO you always have a picture of your cake slices? Do you take them already cut? :-p So this year, I will make this cake and hope to start blogging again since you are my main and ONLY inspiration (of all bakers that I admire) that if you just bake, practice, and do what you love, your dreams may happen to come true at the same time! Thank you so much for sharing this recipe! I am actually currently making it as I type this. Cheesecake cooling and all. Between the pictures, the instructions, and the reviews of it I am so excited to finish making this cake to try it out. I'm making it as a birthday cake for my husband and I'm hoping it holds up for the event! i have a pack of dark,dark brown sugar that claims to be molasses, but i'm not sure. please help! can i use the one i have? Does anyone have any ideas for an alternate frosting? I cannot stand any buttercream frostings, in every possible fashion - including the one that you're thinking about linking me to right now because it must be that I haven't tried that one because no-one hates REAL buttercream. This cake is incredible and I want to make it as a Christmas treat but I would need to find an alternate icing. Does anyone have any ideas? The buttercream calls for unsalted or salted butter (unsalted butter, salted?)? Assembling this cake tomorrow! I'm sure it will be outrageous, like every other recipes of yours that I have followed! Thank you! Happy holidays! Hi there! Made the cheesecake and cookie dough layers today, to finish and assemble the cake next weekend. I'm a little concerned, though - my cheesecake layer is VERY thin. It really did puff up, almost 2/3 of the way up the springform pan, but then it sank very gradually until it's now only about an inch high :( I tasted a little of it from the top edge that needed cutting off, and it was very greasy and the texture and flavor was totally different than a traditional cheesecake - much more of a dense, sweet cheese than the usual light and fluffy. Is this normal for this recipe? I followed it to a T except I used regular molasses. Should I be concerned about it holding up in the middle of the cake, or maybe I should make a second layer to get the height? Thanks for the thoughts - I just wrapped it for the freezer and realized, it's really more like half an inch, and I already made the "a lot of cookie dough" layer :/ Looks like I'll be trying again! Question - is the texture/flavor supposed to be very different from a traditional cheesecake, so it can hold up the cookie dough layer? Meaning, should I try this recipe again as opposed to using a more traditional one? I may have heated my cream cheese a little too much before adding it to the butter & sugar - it wasn't melting at all, but was a little warm. Could that have affected things? I think my bp is fine, but I could probably stand to replace it now anyways. I wonder if there's a way to test it's freshness - the box/can is long gone as it lives in a glass jar. Think I should use 1Tb of light corn syrup instead of 1Tb of molasses since I don't have sorghum? I made this for a double birthday dinner tonight. Everone loved it! Thanks for the great recipe...think I will make the coffee and donuts cake next. Any idea where I can get a cake stand like the one in the picture? Heather, I made your PBC4 cake for Thanksgiving and it turned out amazingg!! HUGE hit! I am now attempting this for my two best friends birthday cake! They are lovers of all things cookie dough. One question... do you have any suggestions of an icing that wouldn't ruin the flavors of this cake, but that I could still write Happy Birthday on top? Thank you ahead of time for any advice! I just made this and brought it into work this morning. It was gone within 20 minutes, and now I'm an office hero! Thanks for the amazing recipe! Hi Heather, i'm wanting to make this cake minus the cheesecake layer for a non-cheesecake loving friend! Do you think the cookie dougw layer would hold up between two devils food cake layers?! I'm presuming it will, but would rather not take too much of a risk! It should hold up fine! I'd definitely let the cake stand at room temperature before slicing so the cookie dough layer will be soft enough to cut without compressing the bottom layer of cake. Hope this helps - best of luck with the cake! I made this for a family get together. Overall for such a complicated cake it was fairly easy to make, assemble, and decorate. However, other then the presentation it received mixed reviews. Some thought it was great and others said it was too sweet. In my opinion it was sweet but the individual layers themselves were good. I'm not discouraged looking forward to trying another one of your great recipes. Overall this was great! I would probably use a different devil's food recipe next time (I thought this one was a tad too dry) and a thicker cheesecake layer (although mine may have just sunk more than usual because of the temperature of the house). 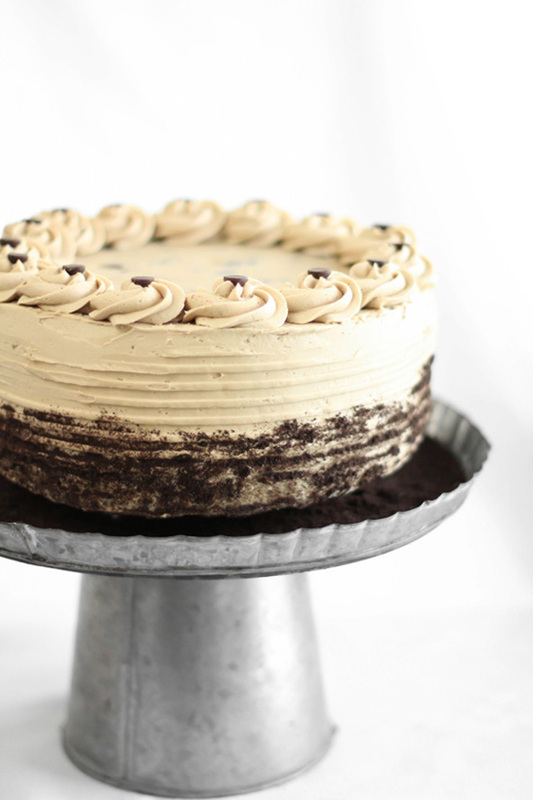 I also might add some whipped ganache in between the cake and cheesecake layers instead of the molasses buttercream. Thanks for the fabulous cake! Hi! Your cake looks AMAZING, you're so talented! I'm hoping to make this for a friend's birthday this weekend but I was wondering if you thought it would be possible to adapt the ingredients/baking time somehow to make two smaller cakes? I want to kind of test run one at home to make sure it tastes okay before I bring one to my friend! What type of knife did you use to cut this cheesecake. I used a large chef's knife for slicing. You can warm it under a stream of hot water then wipe it clean before slicing. The heat will make slicing easier. This looks amazing, and I can't wait to try it! Just curious though, in the ingredients for the buttercream, it lists unsalted butter, salted. Is this meant to say melted or softened? Or is it just salted butter? Eeeps - Holly, it's supposed to say "softened". I'm surprised no one else has caught this - thank you! I've had this recipe saved on Pinterest for over a year waiting for the right celebration. Today my first born turns 18 and he will be greeted with this cake when he wakes up. It looks amazing! Since I'm not a fan of molasses, I just left it out of the buttercream (tastes great, by the way) and only put 1 tablespoon in the cheesecake (no problems there). I can't wait to cut into it and see how it all tastes together. hi.. umm i just want know. for the cook & serve vanilla pudding part. Do you make pudding first before adding to the cream cheese mixture? or you just put 1.5oz vanilla pudding powder in the mixture? Hi! You just add the powder. I made this last night with fresh baking powder and my cheesecake was super dense and thin. Is there something I can do to keep it fluffy? (beat it less or more with mixer maybe?" Same for the devil's food cake. The first one was a hit taste wise, but I'm worried the density is off. Making it for a party tomorrow. THANKS!!!!! I'm afraid I'm too late with my response! It's really hard to say what went wrong. You might beat the cheesecake mixture less, and place a pan of hot water in the bottom of your oven while it bakes. The steam should help the cheesecake from falling. And the devil's food cake is thin and dense also? This isn't something I've encountered with this cake. Hmm, maybe mix the batter until it just comes together. Sometimes over-mixing can make otherwise fluffy cakes tough. Just saying I love your recipes! I made this cake, and my dh did not enjoy the icing so I just added peanut butter (no extra sugar or anything), and he loved it. I will be making this one again :) Thanks!! Hello. I've been saving this cake to make for my husbands birthday which is coming up Monday. But due to planning a surprise party for him my weekend is now packed! Could I make the portions this week and freeze them, then assemle and frost on Sunday night? Yes! Just make sure to let the assembled cake come to room temperature before serving. The flavors are best at room temp. This was amazing. I particularly loved the cheesecake layer! Everyone was impressed! Thank you! I wish I had enough time to make this cause it looks delicious but looks like it takes wayyyy to much time! In the recipe it says "1.5 cups unsalted butter, salted" which confuses me. I'm just going to assume that it is a typo and it's supposed to be "melted" instead of "salted"? Love your blog, love your book! I know for a cake this decadent and delicious, it is probably for a special occasion, but does anyone have any kind of nutritional information on this cake? I need to have a round about figure of calories, carbs, and sugar. Thank you and it looks better than amazing. I made this bad-boy for a get-together with friends this week, and it was a huge hit! Personally, I wasn't a fan of the molasses-frosting. I used Grandma's molasses...maybe it's the wrong kind? I ate a piece anyway, don't think I didn't! :) Thank you for sharing your awesome recipes! Was there anything you substituted or left out of the recipe? How long did you bake it and in what kind of pan? Can I use any cheesecake recipe and bake it without the crust for the cheesecake layer? Also I was just wondering, is the pudding for texture or flavor (or both)? This looks delicious, I can't wait to make this for my sister's birthday! You may use your favorite cheesecake sans crust provided the texture is dense enough to support the cookie dough layer. The pudding is for texture - thanks for your questions! Oooh i made something very similar a few months ago, and it was delicious! Loved seeing how you had a different take on it. I’m definitely making this! thanks for sharing! This is amazing! I had so much fun trying out your recipe today. While my result doesn't look quite as pretty as yours, I am so excited to taste it with my family for Mother's Day! hello wondering if anyone figured out a substitute for the pudding mix? I live in aus and cant find it? can I just add a flour mix? OK, I think this is the first time I'm about to say "This is way out of my league" and talk about food. Just amazing! Strawberry Cream Cake - A Guest Post! Mochi - A Guest Post for Bakingdom!